Soil moisture in the iRON network is measured by dielectric probes which are left in place year round. These instruments are currently being calibrated according to manufacturer recommendations. 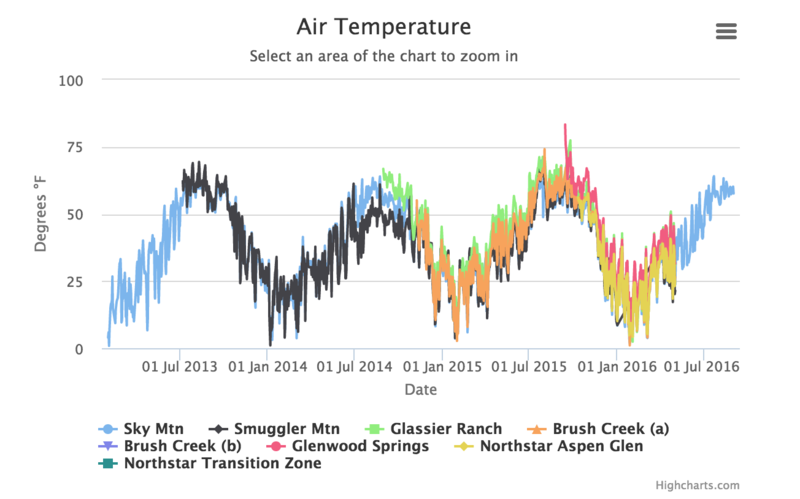 By summer of 2017, downloadable data files will be updated with the most recently calibrated data set. 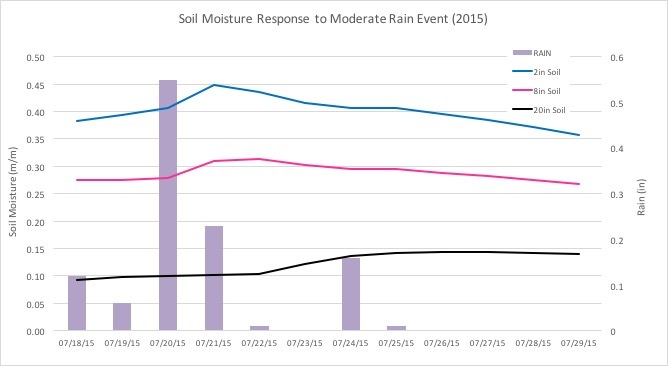 Soil moisture describes the amount of water held in the soil at a given time. It is a vital player in determining what plants live where and is determined by a number of different factors. 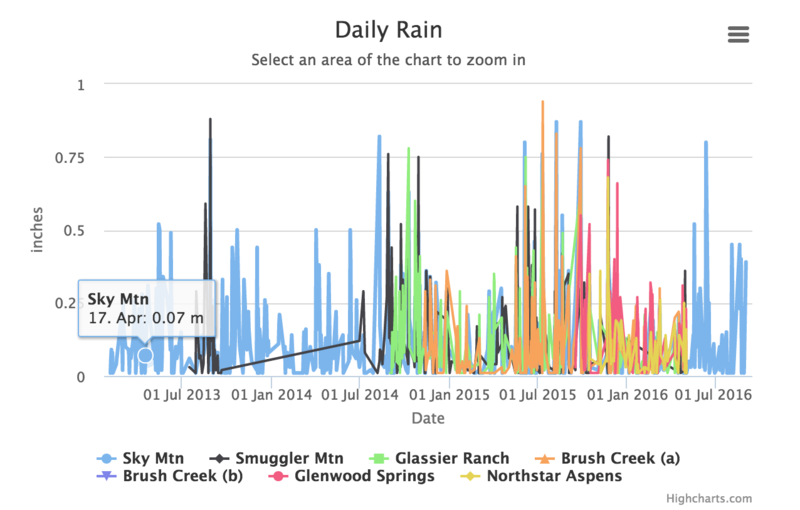 How much water is available to the soil is determined by how much precipitation an area receives, whether that precipitation arrives as snow or rain, and how much precipitation falls at once. Whether the water remains in the soil is determined by complex factors as well, such as the slope of the land, evaporation rates (which are tied to air temperature and wind), uptake by plants, and soil type. For example, some soil types are saturated and unable to hold more water at a 30% soil water volume, whereas other soil types can hold up to 50%. 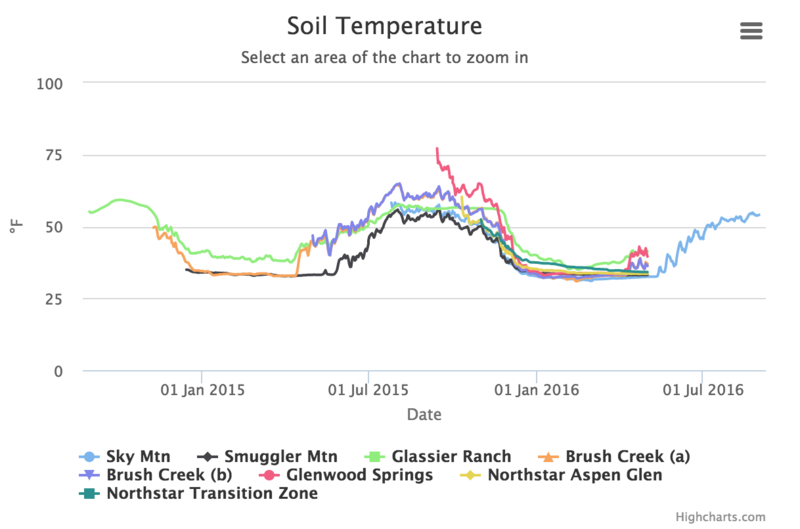 In the graph below, you can see a lag time in water percolation into the ground for a loamy soil (Sky Mountain). At the 2inch depth, soil moisture responds to a moderate rain event (.54in) rapidly, the 8in responds the same day but moisture rises less sharply, and the 20in soil moisture does not begin rise for another several days.